While our program helps in all three areas, the major point of difference in our software is that it builds language processing skills. It helps connect letter sounds to text while it builds phonemic awareness. Both skills significantly improve phonics and phonetic spelling in just a few months. Because words with phonetic standard spelling are 85% of all words, this improvement alone will help make your child a good speller. While spelling attempts to transcribe or convert spoken language to text using alphabetic principles, about 15% of words have irregular spelling. The spelling is not phonetic. Either the way a word is pronounced changes or words come from other languages where the foreign spelling is retained. As is the case with American English, non-standard spellings become standard after extensive common usage. Finally, there is the difficulty of homophones, e.g., sew and so, words that sound the same, but are deliberately have different spellings so are distinct usually. All of these complications can make English a hard language to spell, even if your phonics skills are solid. However, if your child is not recognizing spelling patterns, there are almost always other reading problems at play. It could be an indication that either phonemic awareness is lagging and so the sounds inside words are not clear. Alternatively, it could indicate a limited capacity to learn by observing how words are spelled while reading. This in turn indicates an inefficient reading style, possibly held back by a cognitive skill delay. Either way, spelling difficulties are more often than not a symptom of a deeper-seated language or reading difficulty. That is why our approach is comprehensive. It uses adaptive exercises in a range of cognitive skills. Our exercises will either expose learning difficulties or provide your child with a clean bill of health learning-wise if he can successfully complete the exercises. It is important to understand, that spelling — an understanding of how words are spelled — plays a central role in how the brain eventually turns every word into a sight word. The only way the brain can catalog the thousands of words in the English language is by recognizing spelling patterns and organizing them accordingly. Weak spelling skills delay reading proficiency because they impede this mapping process, this conversion of the entire English language into sight words that connect to meaning. The level of concentration required to retain phonetically regular words crowds out capacity to retain exceptions. If you are looking for one of those online spelling programs that gives your child a few words, you will need to look elsewhere. Gemm Learning is a comprehensive reading and learning program. It’s an industrial-strength approach to spelling and reading. One of its focal points is spelling at every level, because spelling is a critical reading and writing skill. While most spelling software programs stimulate memorization, we build spelling skills from the fundamentals up, as part of a larger protocol that tackles all aspects of reading — not only spelling, but also vocabulary, grammar and language syntax. Our software trains phonological awareness to build letter sound associations and a phonics foundation. From there it works through spelling conventions, rules and exceptions in sequence. When every word is hard to spell, learning to spell is overwhelming. 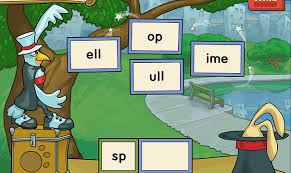 Our spelling software improves listening accuracy making phonetic spelling of regular words (84% of all words) much easier so that your child can focus on rules and exceptions to learn how to spell the remaining 16% of words. Our spelling exercises also develop listening and reading efficiency, making it possible to observe how to spell while reading and listening. This is how skilled and natural spellers learn to spell. Our spelling software methodically builds spelling skills, step by step, grade by grade. Unlike most online spelling programs, our software relies on natural learning, discovery, not direct instruction. The sound discrimination and phonological awareness exercises in Fast ForWord Language v2 / Foundations I, Hoop Nut and Moon Ranch, are 100% sound-based exercises. They significantly improve phonics skills, the basis of good spelling. 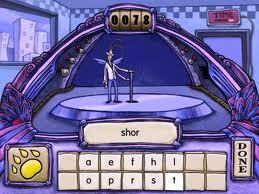 Three of the six exercises in Fast ForWord Reading Level 1 are build phonics and other spelling skills. Magic Bird has a particular focus on phonetic spelling and spelling conventions at a 1st and 2nd grade level. There are two spelling software exercises in Fast ForWord Reading Level 2, for 1st to 3rd grade. Magic Bird uses word building to help improve spelling and to help develop sensitivity to letter-sound correspondences. Fish Frenzy helps develop sight words and Bear Bags uses categorization to improve phonemic awareness, understanding of the alphabetic principle, and decoding skills. There are three exercises in Fast ForWord Reading Level 3 that help with spelling. 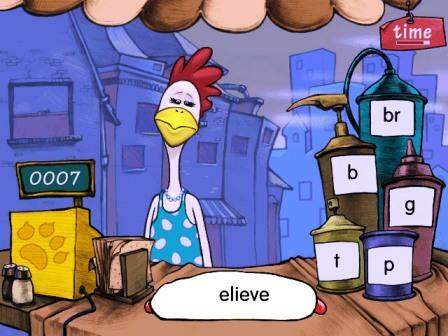 In Chicken Dog the participant spells out and finishes the incomplete words according to accepted spelling rules. Two other exercises develop sight word recognition. In Fast ForWord Reading Level 4, Jitterbug Jukebox helps develop spelling rules and vocabulary for older students. The last stage of our spelling software focuses on understanding the many exceptions in English spelling rules. Wood Works develops sophisticated vocabulary skills and knowledge of spelling exceptions building to a late middle school spelling skill level.